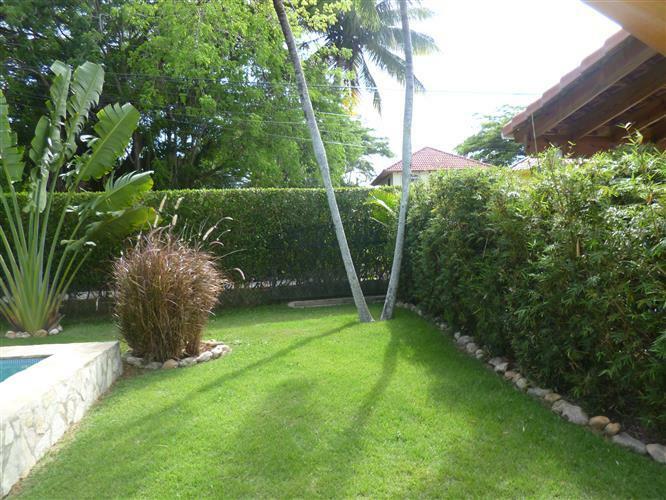 This is a beautiful and very private family home with four bedrooms two ensuite and one family bathroom. Built in an international community of 30 villas each surrounded by herbaceous borders, palm trees, and tropical ferns and flowering shrubs. 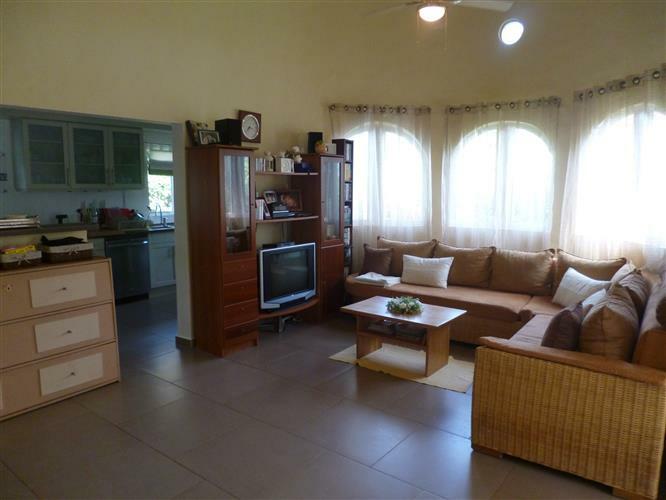 For this house the owner has recently added an income generating guest house so that his friends and clients could stay there without having to access the main villa. 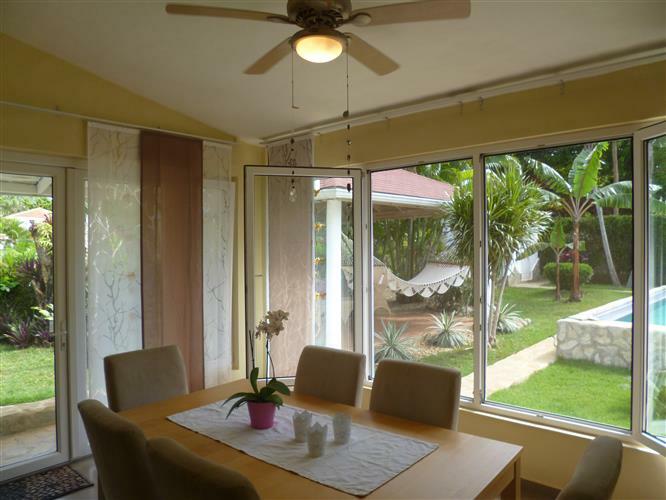 The very comfortable and spacious main living area looks out through German built multi directional security windows, onto a large pool and a very pretty and comfortable Palapa. With a tiles floor and comfortable woven seating and lovely pink cushions plus a hammock which is so attractive that it looks as if it has been crocheted by hand! 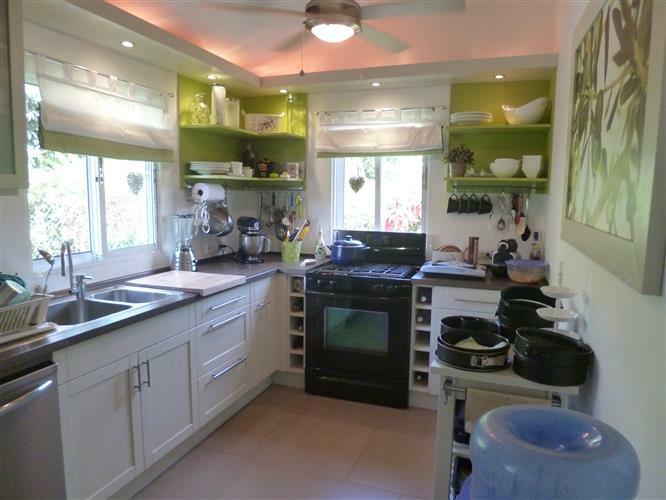 The spacious L shaped kitchen has everything you will require as it is used each week to create mouth watering cakes sold in the high end supermarkets by the present lady of the house. All the cupboards where specially designed and installed so that there is a place for everything, and everything slides and glides with ease! The lighting in the kitchen is also very colourful. 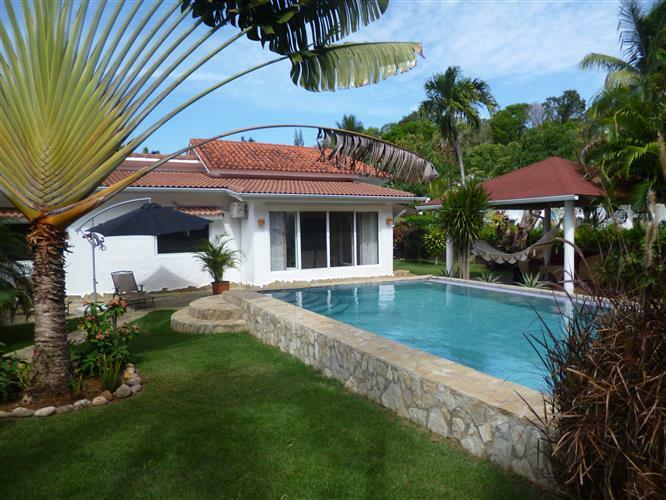 The house is both bright and welcoming and set amid lush green foliage, travelling palms green tropical and flowering catkin shrubs bordering areas of grass surrounding the house and the Palapa on all sides. It is refreshing to see light colored quality furniture and modern and attractive color schemes that match the bright surroundings; especially in the Master bedroom, which blend well with the soft mauve colouring of the coverlet on the Master bed. Here a picture of flowers in greens, browns and natural tones conseals a hidden door connecting to the daughter’s bedroom. You can sense it is a happy home which is confirmed when you enter the second bedroom used by the young daughter as it’s full of happy faces of animals and dragon flies on the walls. All decorated in pinks and creams and every item chosen with the utmost care to blend in. 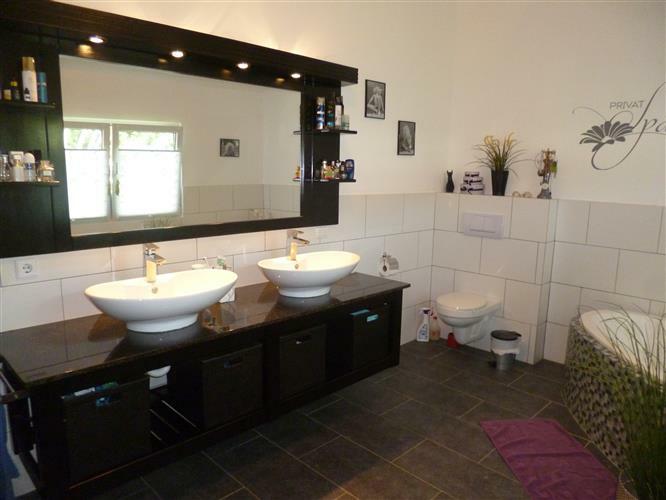 The family bathro0om is a delight to see with large wide mirror, modern his and her washbasins and a modern and attractive bath tub in the corner. Both the ensuite Master Bath and the family bathroom are elegant in their simplicity, in their use of black, white and wide mirrors and attractive lighting which provides the finishing touch. 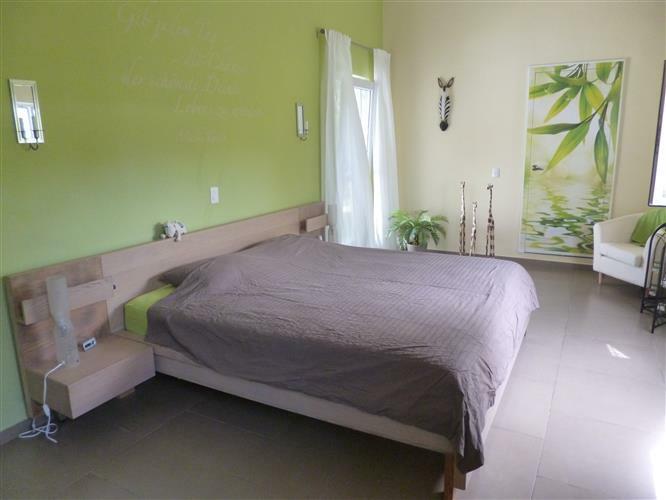 The third guest bedroom is presently being used as an office and the fourth guest bedroom is also ensuite and has its own entrance separate to that of the main house. This too is both unusual and attractively thought out, as the turquoise bands of colour enlarge the whole area and the room looks out onto the terrace and pool area. A small wall boarders this large and lovely pool with gentle steps leading into the shallow end, just perfect for the children! 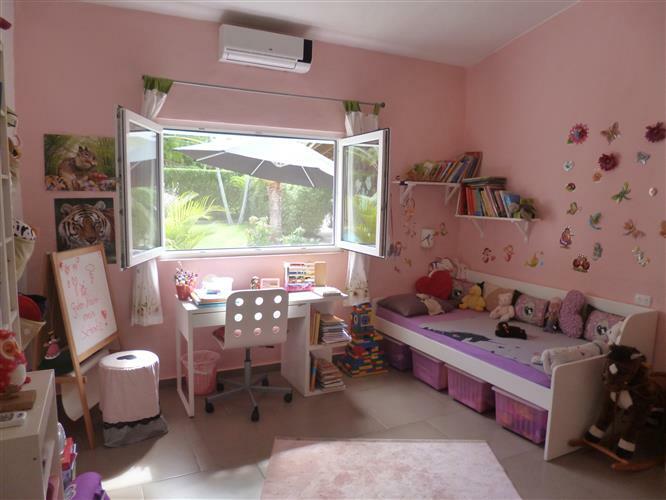 The fourth bedroom would also share the family bathroom and at present is used as an office. 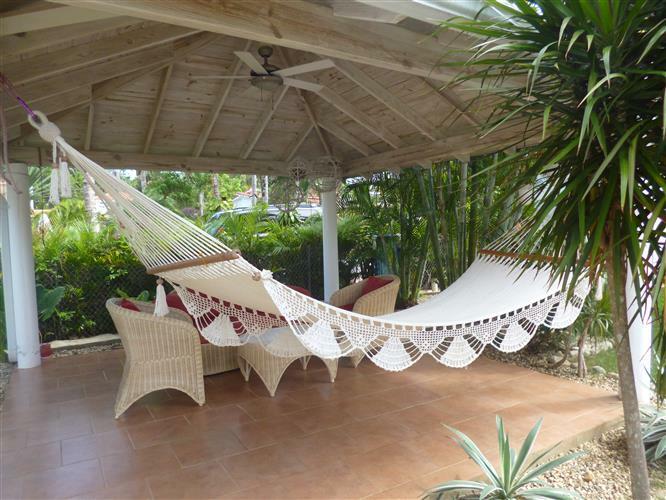 The garden has many tropical plants and a Palapa which is perfect to sit under or swing in the hammock on a hot sunny day which is almost all year around! 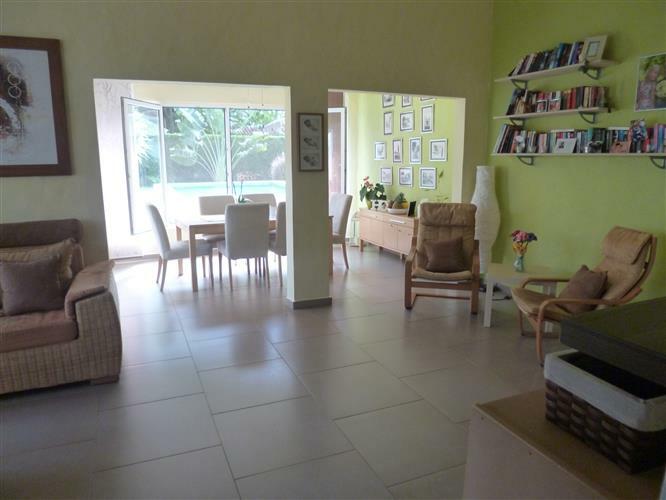 The area is popular with dog owners as there are many places to walk the dogs, including a short walk to the local colmades where you can stop and have a drink and talk to other owners and renters, living in the area. It is especially popular in the evenings and often has live music. Further down the road are two schools. One of which is very popular with foreign owners as there are over thirty eight different nationalities studying there. The area is ideal for children as they can roam the countryside on their bikes as some European and Dominican children do, all happily speaking Spanish to one another in different accents. 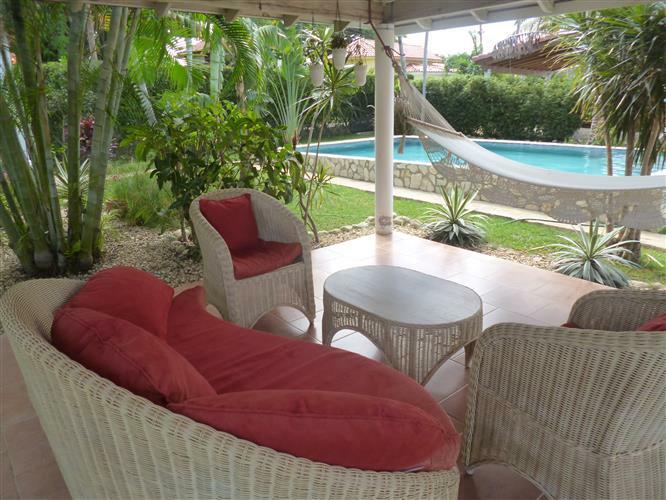 If you are looking for a home in the Caribbean where you can generate some income from renting out the guest apartment, you should look at this comfortable villa in the heart of a well established community in the Sosua hills and only a two minute drive into town and only a ten minute drive to the Puerto Plata International airport, it is all so convenient and a very peaceful and beautiful area to live in.! Sosua has four main beaches including the Sosua Bay beach with its crystal clear waters ideal for swimming, snorkeling and diving around the reefs and just ten minutes away in the opposite direction are the world famous surfing and kite surfing beaches, where competitors come from all over the world to compete in the championships. There is a forty mile lagoon to explore and caves to visit in this wonderful El Chocó national park. 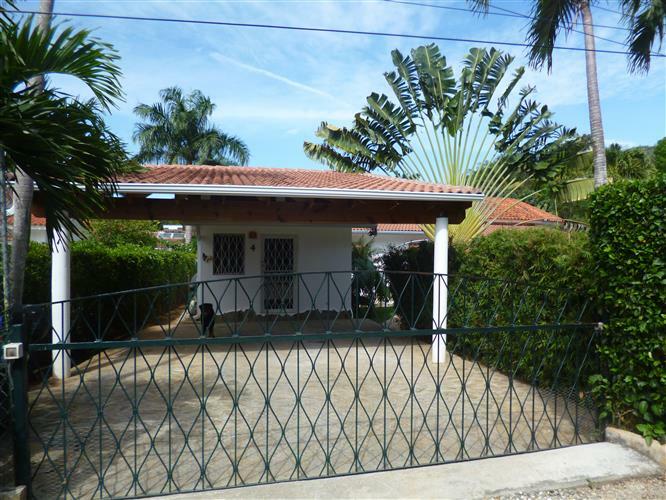 Please complete the information box for more details of this lovely Sosua house and the buying process here in the Dominican Republic.